June, and we are well into the Formula 1 racing season – and there’s also a bit of a race going on in our Solar System. We have Mercury racing ahead as ever, with Saturn leading the rest of the pack. Then Mars – but the Earth is gaining rapidly, having just overtaken Jupiter. Finally, Venus is on fresh tyres and rapidly reducing the lead we have. Uranus, Neptune and Pluto are, as ever, plodding around the circuit as lap markers. What does all this mean as regards what we can see in the night sky? Well, basically, anything that is in front of us is a morning object and anything behind is an evening object. As we overtake a planet, it can be seen all night. We never overtake Mercury or Venus. So, starting with Saturn, it rises early, just before midnight, and can be seen till the Sun obliterates it at about four in the morning. Mars pops up about an hour later, both being low in the south-eastern sky. This is also where Jupiter appears but as we have just passed it on the home straight, it rises a little before sunset and is in the sky all night. As for that sneaky Venus, it too appears as the Sun goes down but in the south-west, and is visible until it sets a couple of hours later. Mercury starts to lap Venus towards the end of the month and can just about be seen between Venus and the Sun during the last half of June. The Moon appears to rather crazily travel against the flow, passing each planet in turn. So, on the 16th it is just to the left of Venus. At this time it is a very thin crescent as it is just three days old. Now, for simple-minded folk who might think “Three days old? I’m sure I saw it last week!”, I must point out that this just means it is three days since the new moon – which itself just means when the Moon is between the Earth and the Sun. Then on the 23rd, it is above Jupiter, which is sitting next to the brightest star in Libra and my favourite, Zuben Elgenubi. 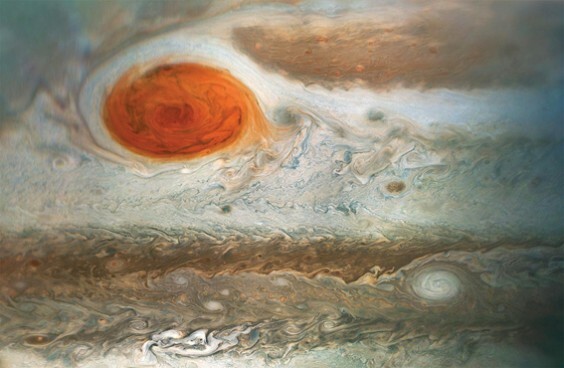 Incidentally, the most famous feature on Jupiter’s disc, the Great Red Spot, appears to be shrinking. It is, in fact, a giant storm in the planet’s turbulent atmosphere and has been around for hundreds of years but may only last a few more. It is visible with a good telescope, or look for some great pictures of it from the newly-arrived Juno spacecraft. Finally, the Moon visits Saturn on the 27th, the day we overtake it – and as the Moon is full on the next day, Saturn will be almost lost in the glare. There are a lot of launches due this month including from India, China and Japan. The ones of interest to us are the Soyuz launch on the 6th and especially the SpaceX Dragon on the 28th. Look for them on http://www.heavens-above.com to see if they become visible here in Alvechurch.